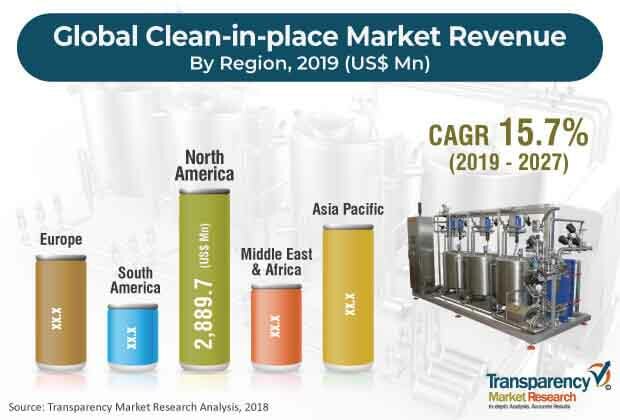 The global clean-in-place market was valued at US$ 7,435.3 Mn in 2018 and is anticipated to register a stable CAGR of 15.7% from 2019 to 2027, according to a new research report published by Transparency Market Research (TMR) titled ‘Clean-in-place Market – Global Industry Analysis, Size, Share, Growth, Trends, and Forecast, 2019–2027.’ Growing adoption in food and pharmaceutical industries, advantages offered by multi-tank CIP systems, rising adoption of automated CIP, and technological innovations drive the global clean-in-place market. The market in North America is expanding at a significant CAGR of 16.9%, owing to numerous technological innovations and growing concerns about hygiene in the food industry. Industries that rely heavily on CIP are those that require high levels of hygiene, such as food and pharmaceutical industries. CIP systems play an important role in the food industry, as it is very important in this sector to maintain hygiene and keep machinery and equipment bacteriologically clean. With increasing preference for food hygiene and sanitation, manufacturers are following strict clean-in-place (CIP) after every production shift. The CIP system is designed to automate essential cleaning and disinfection processes as well as to avoid time-consuming work of disassembly and assembly. Demand for clean-in-place systems is rapidly increasing in the food & beverages industry, as process piping and vessels used in the industry require frequent cleaning to remove residue from previous batches and sanitize the process piping as well as vessels. Several global players are continuously focusing on maintaining hygiene to ensure high safety and quality of products. For example, Alfa Laval has introduced a twin-screw model as the latest addition to the company’s hygienic pump portfolio for use in dairy, food & beverages, and personal care industries. This model is capable of handling both product transfer and clean-in-place (CIP). Pharmaceutical manufacturers in the North America region are practicing frequent cleaning of interior surfaces of their process equipment so as to comply with stringent hygiene-related regulations in the region. Use of automated clean-in-place systems reduces labor requirements, as safety operators are not required to enter the plant to clean equipment. With the help of automated operations, difficult areas can be cleaned very easily. Also, they help minimize the production downtime between product runs and reduce cleaning costs. Moreover, due to recycling of cleaning solutions and rinse water, automated CIP systems provide quality assurance and offer complete information for quality assurance requirements. These factors are expected to boost the global clean-in-place market during the forecast period. Several industries such as food & beverages and healthcare are focusing on automating their critical cleaning and sterilization processes in a controlled and documented manner. They are implementing automated clean-in-place methods in order to automate essential cleaning and disinfection processes and avoid time-consuming disassembly and assembly work. In addition, numerous modifications can be made in the existing systems in order to save water, chemical use, time, and energy. Geographically, the global clean-in-place market has been divided into five major regions. These include North America, Europe, Asia Pacific, South America, and Middle East & Africa. In 2018, North America was the leading region, followed by Asia Pacific. This can be primarily attributed to advancements in technology and rising need in the region to enhance the ability of the sanitation crew to clean and sanitize production equipment in a better manner. Rapid growth of the healthcare industry and early adoption of automated CIP systems are some of the factors driving the market in the region. The U.S. held the maximum share of the market in North America in 2018. The market in the country is estimated to expand at a considerable CAGR during the forecast period. The market in Europe is anticipated to expand at a significant CAGR during the forecast period, owing to increasing concerns about hygiene and rising investments in the region. The clean-in-place market in Asia Pacific is expected to expand at the maximum CAGR of 16.9% during the forecast period. Factors such as growing technological advancements and growth of the food & beverages industry are expected to drive the Asia Pacific clean-in-place market during the forecast period. Also, growing population and increasing disposable income of people in countries of Asia Pacific have led to increase in the demand for processed food, dairy products, beverages, and pharma products in the region. The market in Middle East & Africa and South America is expected to expand at a substantial pace from 2019 to 2027, due to growing adoption of automation in these regions. The company profiling of key players operating in the global clean-in-place market includes company overview, major business strategies adopted, SWOT analysis, and market revenues for years from 2016 to 2018. The key players operating in the global clean-in-place market and profiled in the report are Tetra Pak International, GEA Group, Alfa Laval, Krones AG, KHS GmbH, Centec GmbH, SPX FLOW, Sani-Matic Inc., Melegari Manghi, and Millitec Food Systems Ltd. Various players are introducing technologically advanced clean-in-place equipment and establishing partnerships with other players to meet the continuously rising demand for processed food, dairy products, beverages, and pharma products.